Happy Monday everyone! I am getting antsy for the weather to start warming up and spring to get here so I guess it isn't surprising that I made a card using lots of spring colors. 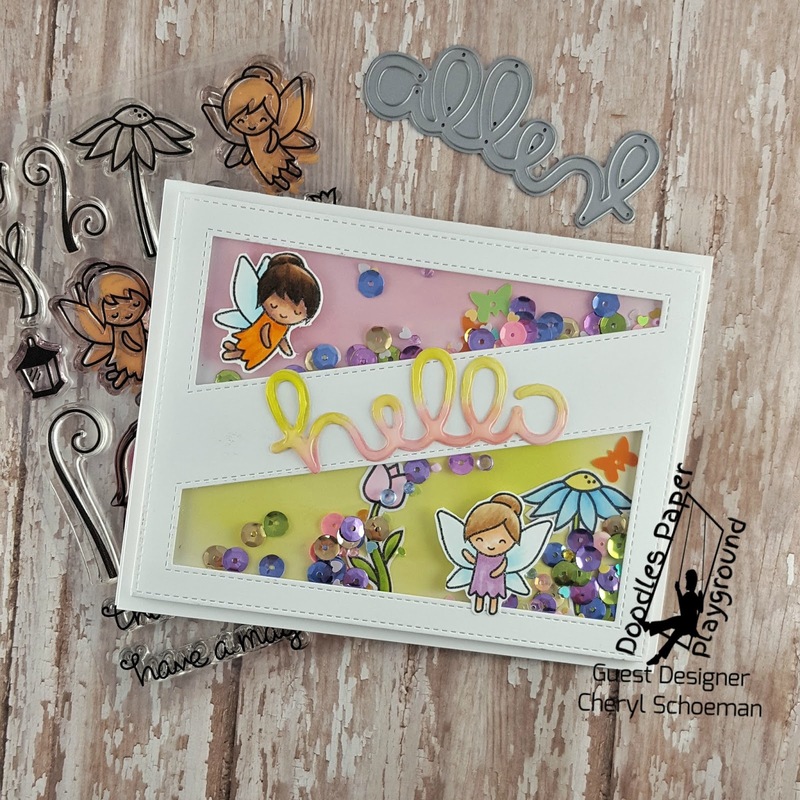 I am also excited to share with you that this is my first project using the new Sparkle Blends from Doodles Paper Playground. I will be doing a few guest design posts for them this month! Doodles Paper Playground is a new company that has its own sequin embellishment blends, Sparkle Blends. Today, I used a sparkle blend called Spring Fling as my inspiration to make this happy spring shaker card. I have several stamp sets that were packaged in heavier acetate and keep them for shaker card projects. I took one of them, trimmed it down to the size of my cover die and then adhered it to the inside of my cut cardstock. I used my top piece as a guide to figure out where I wanted my flowers and glued them in place. I also took a note from Jennifer McGuire and glued a few of the butterfly embellishments from the sequin blend in place so they would always be flying. To finish the shaker portion off, I glued the fairies to the top cover and added foam tape along all of the edges. I added the Sparkle Blend to the colored portions of my card directly and then took the release tape off and placed the top cover on. The sentiment was a die that I already had cut out I used the same distress oxides to pounce color on the top and bottom. After I glued it down, I covered it with glossy accents to give a little sparkle and dimension. You can see some of the different elements of the sequin blend in the picture above. I love the tiny hearts and seed beads that are included. Thanks so much for visiting! I always appreciate it and love reading your comments. Super cute, and definitely makes me think of Spring! Love this adorable shaker design! The colors are so full of Spring and the little fairies are so cute! I'm so happy you joined the Inky Fingers challenge at Lawn Fawnatics!